What Are the Coffee Enemas for Cancer Benefits? There are many different things that are available to us to improve our health. Perhaps we could try to eat a proper diet, get plenty of sleep, drink enough water to stay hydrated and exercise on a regular basis. Those factors can go a long way to keeping us healthy but sometimes, it is to our benefit to try something more. One option that has helped many people to enjoy a wide range of health benefits is a regular coffee enema. Many people think that a coffee enema is only for those who have a serious health problem, such as cancer. Certainly, the use of coffee enemas for cancer is something that is worthy of discussion. Before we discuss those specific benefits, let’s take a closer look at what they can do for you and your general health. Constipation – Many people who suffer from constipation would benefit from a coffee enema. It can help to relieve the constipation easily and without any harmful chemicals involved. Many people find that coffee enemas are the true key for constipation relief and they experience long-term benefits as a result. Energy – a lot of people who use enemas regularly claim that they have improved their energy levels significantly. Let’s face it, all of us could use more energy and an enema may be the way to get it. Immune System – Would you like to give your immune system a boost and reduce how frequently you feel ill or sluggish? Many people have experienced this benefit after using a coffee enema. Parasites – If you have parasites in the digestive tract, a coffee enema may help to flush them out naturally. It could also help to discourage those parasites from setting up shop again. Depression – One of the most common ailments that humans experience is depression. It affects a significant portion of the population. Most people will reach for an antidepressant or try to suffer through it but relief may be as close as a coffee enema. As was stated, lots of individuals who use coffee enemas will do so because they are experiencing a significant health problem. For those who have cancer, a coffee enema may be the key to helping with the treatment. The following are some of the specific benefits you may experience when you use coffee enemas for cancer. Immune System – As was stated earlier, coffee enemas help to boost the immune system. In doing so, it may help your body to fight the cancer naturally. Having a reduced toxic load as a result of coffee enemas, the immune system is then allowed to focus on doing its job which is to help protect the body. Detoxify – Coffee enemas can help to detoxify the colon by cleansing it directly. It can also help to facilitate the removal of toxins from the entire body. Regardless of whether you have colon cancer or any other form of cancer, a coffee enema may help. Boost Your Enzyme System – There is some research that suggests a coffee enema can boost your enzyme systems. In doing so, it can help to remove toxins and flush free radicals from your body. 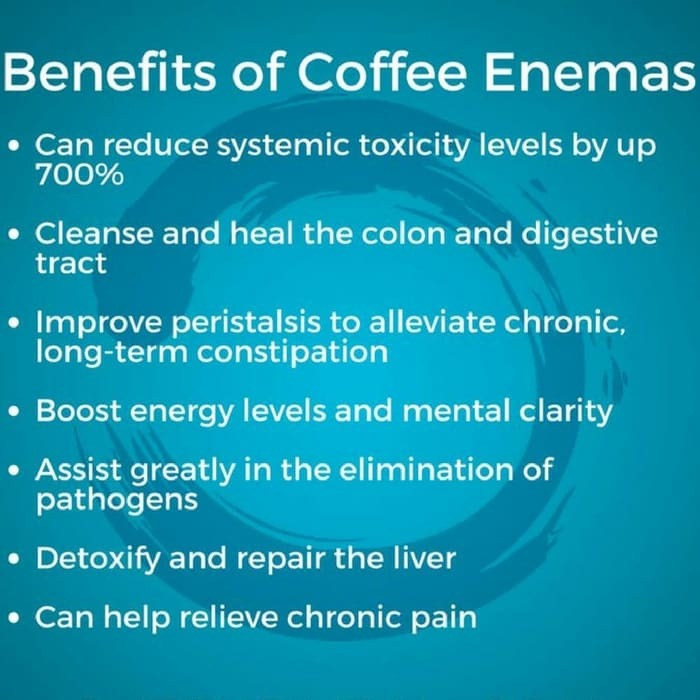 These are just a few of the benefits of using a coffee enema regularly. Once you begin using it for yourself, you will discover why it is such a popular choice for those who want a higher level of health. Coffee enemas are just one of our many adjunct therapies which are part of our complete cancer care program.